The Adobe® Acrobat® Pro offers a powerful tool for automating repetitive tasks called "Action Wizard" ("Batch Processing" in earliest versions). The Action Wizard can apply a series of document processing commands (called "actions") to one or more PDF files. Once an action is created, it can be executed either manually from the Adobe® Acrobat® toolbar or from a command-line batch file using the AutoBatch™ plug-in. 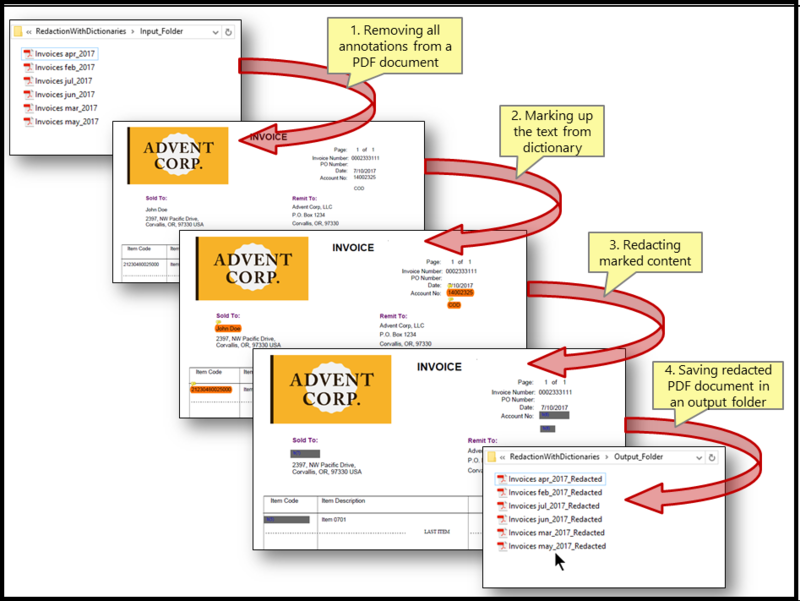 You need a copy of the Adobe® Acrobat® Pro DC along with the AutoRedact® plug-in installed on your computer in order to use this tutorial. You can download trial versions of both the Adobe® Acrobat® and the AutoRedact®. Start the Adobe® Acrobat® Pro DC application. Select the "Tools" panel located on the main Adobe® Acrobat® Pro DC toolbar. Click on the "Action Wizard" icon to open tool controls. Step 2 - Create New "Action"
Double-click on the "Remove Annotations" command or press "+->" button to add it to the list of action steps. Step 5 - Click "Specify Settings"
Uncheck the "Prompt User" box, otherwise this command would always prompt for settings when executed. Click "Specify Settings" in the "Action steps to show" box. Select a processing page range and annotation types to remove. Click “OK” once done. Expand the "More Tools" category and double-click on the "Mark Up Text From Dictionary" command or press "+->" button to add it to the list of action steps. This command searches the PDF document for the user-defined set of words and highlights them for redacting. The search terms are stored inside a "redacting dictionary". Redacting dictionaries are collections of words/phrases that need to be redacted from documents. The content of the redacting dictionary is typically user-specific and is often used on the regular basis to redact multiple similar documents. Step 8 - Click "Specify Settings"
Uncheck the "Prompt User" box, otherwise this command would always prompt for settings when executed. Click "Specify Settings" of the "Mark Up Text From Dictionary" command. The "Select Redacting Dictionary" dialog will be opened. If you have previously created a redacting dictionary that you want to use, then skip to Step 14. Click “Manage…” to open the managing redacting dictionaries tools. Click "Create New…" button in "Redacting Preferences" dialog to create a new redacting dictionary. The "Edit Redacting Dictionary" dialog will appear on the screen. Enter dictionary name and description for the new dictionary. It’s a good idea to provide a short unique name and a longer description. This will help you to identify this dictionary later. Click in the "Redacting Text" column to enter new or edit existing words and phrases that need to be redacted from the documents. Click in the "Exemption Code" column to enter new or edit existing exemption code. Optionally, redacting text can be exported to ASCII text file by clicking on "Save As Text…" or imported by clicking on “Import From Text". Click "OK" once done entering all required redacting items. Click "OK" to close the "Redacting Preferences" dialog. Select a redacting dictionary to use for search and markup by selecting one from the "Select dictionary to use" list. Click "OK". Expand the "More Tools" category and double-click on the "Redact Document" command or press "+->" button to add it to the list of action steps. Step 16 - Click "Specify Settings"
Uncheck the "Prompt User" box, otherwise this command would always prompt for settings when executed. Click "Specify Settings" of the "Redact Document" command. Press the "Edit Preferences..." button. Select desired processing options in the "General" tab of the "Redacting Preferences" dialog. Use the "Redacting" tab to control a visual appearance of the redacted documents. Specify a redacting character to use for replacing the redacted text. By default, a blank space character is used. Uncheck the "Add exemption codes to the redacted areas in output document" box in the "Exemption Codes" section if there is no need to display exemption codes on the redacted areas. If redacting bars are required in the output, then check "Fill redacted areas with the color" option and select a desired color. IMPORTANT: Redacting bars are used solely for the visual appearance of the redacted areas. They are not used to cover the text. The AutoRedact® always removes redacted text from the document by replacing it with a user-specified redacting character. Click "OK" once done with processing options. Expand the "Save & Export" category and double-click on the "Save" command or press "+->" button to add it to the list of action steps. Click the "Folder" icon of the "Save" command. Step 23 - Select "Save to Local Folder"
Select "Save to Local Folder" from the options list. Specify an output folder. Click "OK" once done. Step 25 - Click "Specify Settings"
Click "Specify Settings" of the "Save to Local Folder" command. Specify file naming and output options. Click "OK" once done. In the tutorial the "Add to original file naming" option is selected to add "_Redacted" after the original file name. For example, the redacted version of "Account Statement.pdf" will be saved as "Account Statement_Redacted.pdf" file. Step 27 - Click "Add Folder"
Click "Add Folder" to specify an input folder. Specify an input folder. Click "OK" once done. Enter a desired "Action Name" and, optionally, enter an "Action Description" into the "Save Action" dialog. Press the "Save" button to save the action. Now you should see the new action added to the "ACTIONS LIST" toolbar. Click on the action in the "ACTIONS LIST" to execute it. Click "Start" to run the action. All PDF files from the input folder will be redacted using a redacting dictionary and the redacted documents will be saved into the output folder.